Let’s see if I can bang this out in the brief time allotted me. Luchino Visconti’s The Leopard is based on the best-selling novel of the same name by Giuseppe Tomasi di Lampedusa. It is the tale, stretching over decades, of the fall of a royal Sicilian family after the Risorgimento revolution of 1860 and the subsequent Unification of Italy. Visconti narrows the focus down to a scant couple of years. 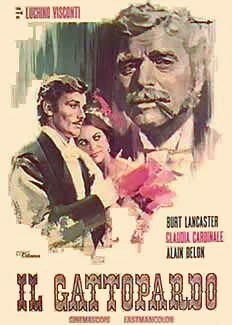 Burt Lancaster is the Prince Don Fabrizio Salina, who will spend a fair portion of the movie trying to insure his family’s well-being in a time of a rising middle class while at the same time see to the future of Italy. Never abusing his power, he urges his subjects to vote for Unification, even though he realizes that it will give increased power to people like the boorish nouveau riche Mayor (Paolo Stoppa) of the town where his family vacations. 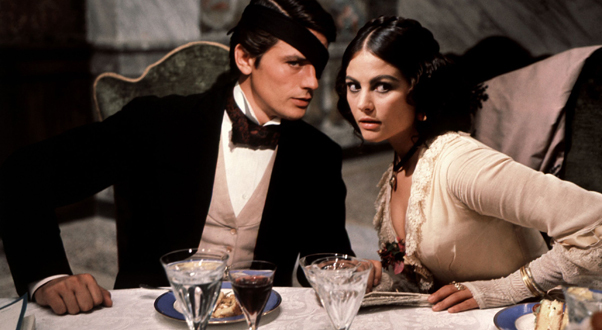 Fabrizio’s favorite nephew, Tancredo (Alain Delon) falls in love with the Mayor’s beautiful daughter, Angelica (Claudia Cardinale), and Fabrizio does his best to move the relationship along, even though it means breaking the heart of his poor daughter, Concetta (Lucilla Morlacchi). Tancredo’s arc is particularly telling. At the movie’s opening, he joins the forces of the rebel Garibaldi, seeking to overthrow the Bourbon government. Shortly afterward, he joins the Royal Army, seeing no irony in this. By the end of the movie, he is a civilian preparing for a career in politics, and applauding the dawn execution of rebels still faithful to the defeated Garibaldi. 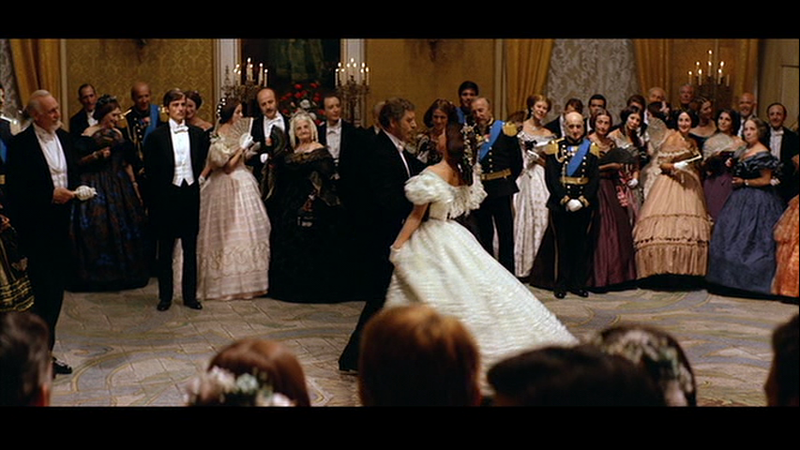 The height of the movie is the dress ball that introduces Angelica to high society before her marriage to Tancredo. Fabrizio walks through the ball with a shroud of melancholy about him; he knows that this will not last, and he finds the company of the Mayor and manufactured war heroes to be tedious and upsetting. He even realizes, in one affecting scene, that he is dying, but he still must last out the night for Tancredo and Angelica, and the future they represent. That ball scene, about 45 minutes long, is one of the most gorgeous I have ever seen, with beautiful, accurate costumes that dazzle and beguile. I was constantly reminded of the similar scene that ends Sokurov’s Russian Ark, so handsome is it. It is small wonder that this movie bankrupted its studio, but the result is so gorgeous, it really deserves to be seen in its original Technicolor, restored beautifully in the Criterion blu-ray. Titanus Films knew they were going to need outside money to even begin to film The Leopard, and there were probably more than a few heart attacks when Visconti first decided he wanted Nikolai Cherkasov (Ivan the Terrible) to play Fabrizio. Cherkasov, though, was on a bender in Siberia or something, Laurence Olivier was too busy, and Fox was willing to pony up three million dollars if Visconti would use one of its stars. Visconti despised this, only knowing Lancaster from Westerns, but after an on-set confrontation, the two made up and became lifelong friends; Lancaster truly is superb in the role. 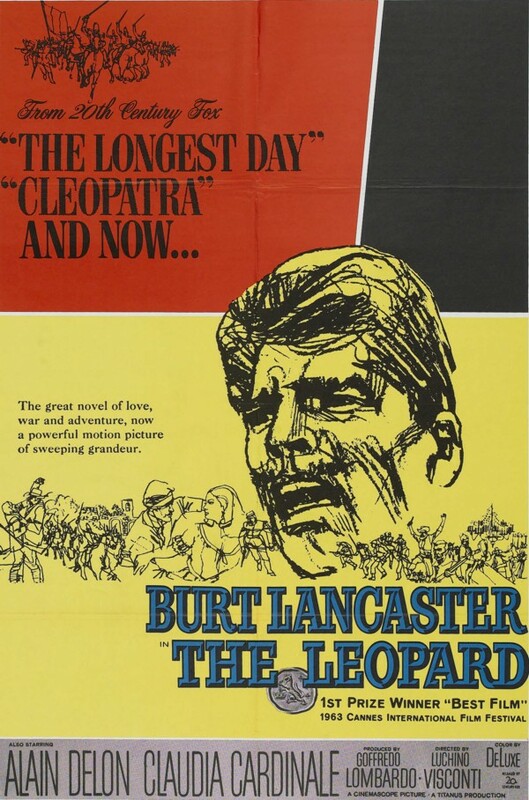 The American box office for The Leopard, however, was dismal, and the movie vanished. Hell, I wouldn’t have even known it existed if it were not for the documentary Z Channel: A Magnificent Obsession and a reminder from Mark Cousins’ The Story of Film. Fox cut twenty minutes, used the cheaper DeLuxe color process for their prints, and, of course, dubbed it into English. This is the only way to hear Lancaster’s real voice in the role, and I have to admit that it was distracting for a while to hear another man’s voice, speaking Italian while Lancaster moved about. But the story is so Italian – so Sicilian, specifically – that hearing it in English robs it of so much identity, the heft of history. I admit that I am a snob about such things, and will always prefer the original language with subtitles, but this is, I think, an instance where is provably true. Most of Fabrizio’s commentary in the ball scene is silent, in any case; it is Lancaster’s attitude and body language that tells the tale of that evening. Quck! Tell me what kind of movie this is! And that is the best way to describe The Leopard: haunting, beautiful, and unfortunately, terribly true. Nobody will be surprised to learn that I really love the Criterion Collection. I’ve had some people try to tell me they’re not all that, but this gets the same response as telling your great-aunt Emily June that Obama isn’t a Muslim: a few seconds of blinking uncomprehension, then renewed screeching. Yes, I am aware they put out Armageddon and The Rock. I am also aware that angel investors have to be rewarded. A few months back, when visiting my parents, I discovered that someone had offloaded a bunch of older Criterion DVDs at the local Half-Price Books. That day I could afford only one, even at half price. When we returned a few months later for Christmas, I had made sure to bring more money, and this time I managed six. 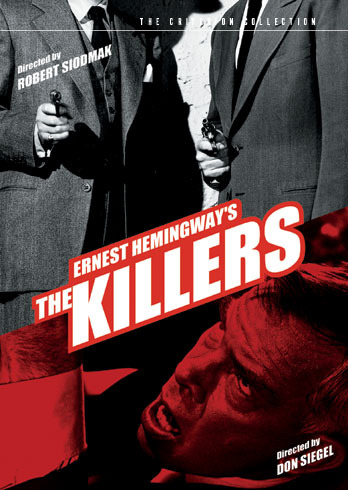 And one was a really fun concept package containing three versions of Ernest Hemingway’s “The Killers”. So anyway, for the tl;dr crowd (and I pity you), it’s the story of a small town diner terrorized by the title characters, two gangster types who are in town to “kill the Swede”, who always comes in at 6:00 to eat dinner. When the Swede doesn’t show, the two killers leave – leaving the diner’s occupants alive, to their relief – and one of them – Hemingway’s guy, Nick Adams, runs to tell the Swede – and the Swede refuses to escape or call the cops, saying it would be no use. Russkies in blackface. But what you going to do? One of the three versions of the story in the Criterion set was made in 1956, and it’s the exam film of several students at the Soviet Gerasimov Institute of Cinematography, one of whom was Andrei Tarkovsky, later the director of movies like Solaris and Andrei Rublev. It is the most literal version of the three, basically translating the short story directly onto film. It’s also only 19 minutes long. It’s worth seeking out just for that; there are a couple of minor film school flubs, but it’s remarkably assured filmmaking, otherwise. 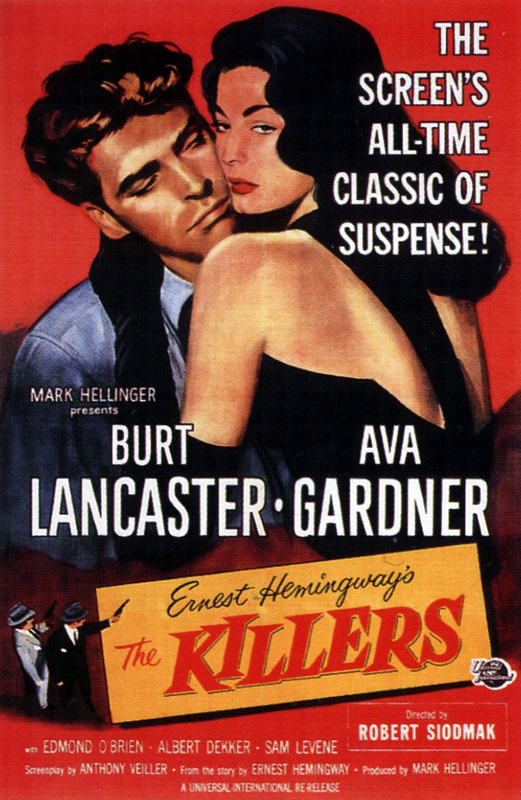 Our first movie chronologically, however, is the 1946 version, directed by Robert Siodmak. It starts with the Hemingway story, practically verbatim, though this time when the killers leave and Nick goes to the Swede – whose name is Ole Anderson, just in case you didn’t read the story – in his boarding house room, it’s barely ahead of the killers. We find out that the Swede is also Burt Lancaster (in his film debut!). He still refuses to run, because he’s tired of running, and “I did something bad.” So the killers bust in and kill him. Yep, we’re only 19 minutes into a 105 minute movie. 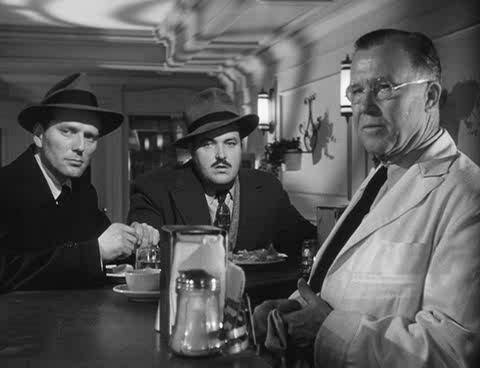 So we leave Hemingway behind and meet Joe Reardon (Edmond O’Brien, increasingly a go-to guy for film noir post-WWII), ace insurance investigator. It seems the Swede had a life insurance policy through the gas station where he worked, and Joe sets out to find why someone would want to employ overkill methods on a grease monkey. William Conrad takes NO guff. 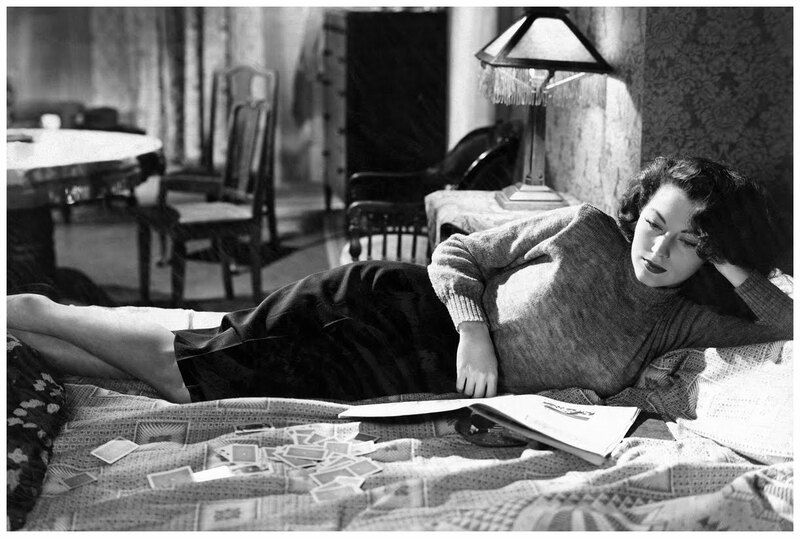 The rest of the movie plays out like a noir version of Citizen Kane as Reardon slowly puts together various people’s testimonies to fill out Anderson’s life: a prize-fighter with a career-ending injury, he falls in with the wrong people, falling for in the case of Kitty Collins (Ava Gardner, who plays a poison dame like you wouldn’t believe). Anderson even takes a rap for her, serving three years in the pen. 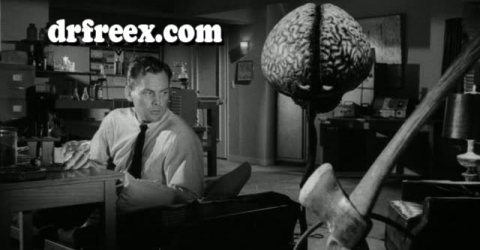 When he gets out, Collins’ once and present sugar daddy, Big Jim Colfax (Albert Dekker, six years removed from Doctor Cyclops) recruits Anderson for a big job that will net them a quarter of a million dollars. Now Reardon is really interested, as that job – stealing the payroll of that most necessary of noir establishments, a hat factory – was covered by his company. Anderson shows up after the robbery and hijacks all the dough and escapes, not being seen again until Big Jim spots him at that gas station (and after last week’s movie, Out of the Past, I now know not to work at a gas station if I’m hiding from a crime boss). There are too many things that don’t add up for Reardon, and he knows that if he’s going to solve this case, and find that money for his insurance company. he’s going to have to find Kitty Collins. I would say, “even if it kills him,” but that’s a pretty safe bet. The 1946 Killers is pretty good noir, full of interesting characters and guys with suspenders carrying pistols and lit cigarettes. That opening sequence (remember, back when we were still doing Hemingway?) 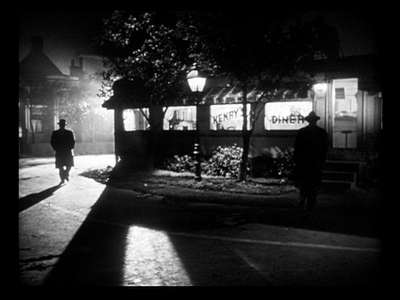 is a little masterpiece of noir camerawork and lighting, our two killers walking in and out of pools of darkness, finally splitting up and approaching opposite ends of the well-lit diner, like an Edward Hopper painting gone wrong, dark and violent. 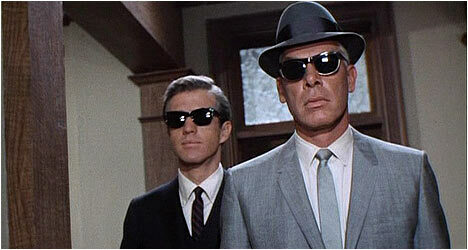 Compare this to the last version in the collection, made in 1964 by Don Siegel. Producer Mark Hellinger had wanted Siegel to direct the ’46 version but the studio nixed the then-fledgling director. Siegel now steadfastly refused to do a remake, and set out to make a movie as markedly different from the ’46 version as possible, and proceeded to filing off the serial numbers. The movie, as shot, was to be titled Johnny North. North is the Anderson character, played by John Cassavetes. 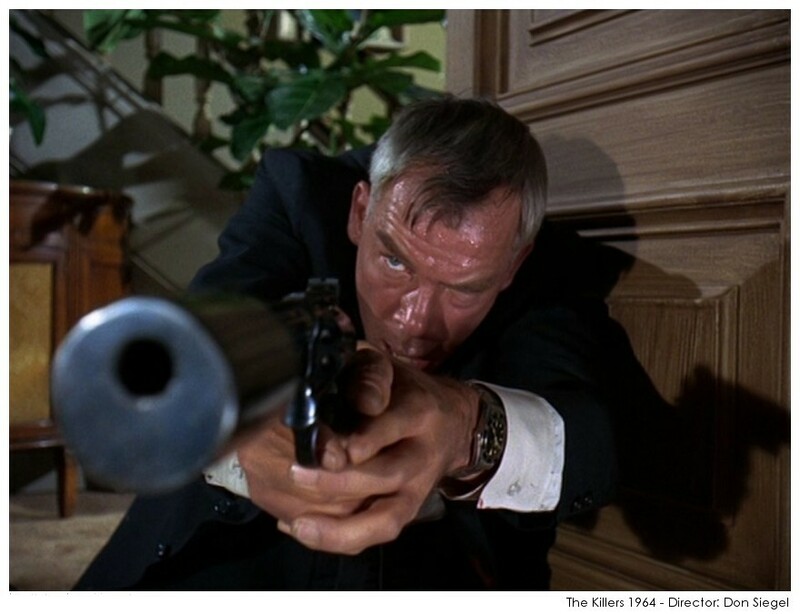 The killers are Lee Marvin and Clu Gulagher. They track North to a school for the blind, where he’s teaching auto mechanics to a group of blind men. Although warned the two men are coming, North simply stands there and lets them shoot him down, and that – along with the fact that somebody paid them more than twice their usual fee to kill a shop teacher – really bothers Marvin. So our two killers take the place of the insurance investigator in the earlier film, and find out North was a pretty good race driver who fell in with a sports groupie, Sheila Farr (Angie Dickinson, whose career keeps intersecting my interests). 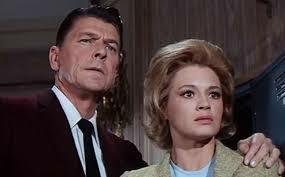 She’s also the property of a shady character named Jack Browning (Ronald Reagan, in his last movie, and playing a bad guy, which he hated). North has a crash that breaks his leg and screws up his vision, ending his racing career. Sheila later finds him working at a drag strip, and Jack needs a good driver for a big job. There are no more hat factories, so they are going to waylay a mail truck that has the weekend’s receipts from “all those resorts on the coast.” All goes according to Reagan’s evil plans, until Johnny slugs him and takes off with the loot. As you can guess, now the killers have to find this Sheila dame and… well, let’s just say it doesn’t have quite the happy, tidy ending of its 1946 predecessor (although there are no loose ends). 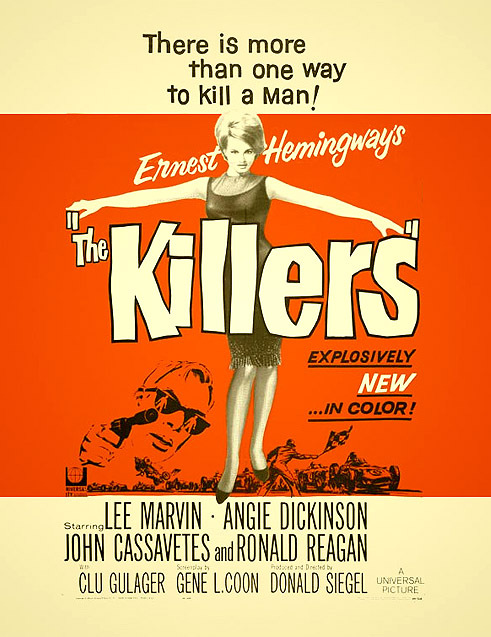 And they still wound up calling it Ernest Hemingway’s The Killers, leading to a lot of critical drubbing, as this is a homeopathic version of the Hemingway story: there’s a molecule or two of the story, floating around in there, somewhere. The title change likely came about because, while it was being shot, it was going to be the first two-hour made for TV movie. When it was judged too violent and too amoral for TV, it was released theatrically, and the name change was likely thought more marketable. The TV origins do work against it, I feel. It feels too brightly lit, and several of the dialogue scenes drag. It has an amazing cast though; I haven’t mentioned Claude Akins as Johnny’s old mechanic, or Norman Fell as Jack’s stooge. 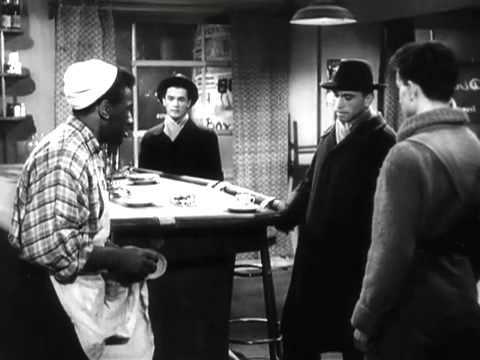 John Cassavetes acted in other peoples’ movies to make money to make his own. That’s not an uncommon story in Hollywood, but the thing about Cassavetes was he always gave value for the dollar. He always gave more in his roles than was necessary. He was damned good, is what I’m saying. 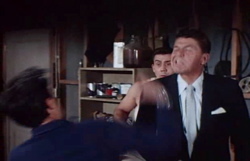 And in The Killers, he gets to slug Ronald Reagan. I’m good with that.